For much of the game Sunday afternoon, it looked like the Jacksonville Jaguars might actually do it. It appeared as if they just might be able to knock off the mighty New England Patriots and earn a trip to the Super Bowl. But then the one thing that couldn’t happen did. Tom Brady started to do Tom-Brady-like things in the fourth quarter with the game on the line. Jacksonville certainly got the job done early on. The defense was a little shaky at first but ended up holding the Patriots to a field goal on the opening drive of the game. They gave up just two first downs on New England’s next three drives. Blake Bortles did his part by guiding the team on a seven-play, 76-yard scoring drive to take a 7-3 lead early in the second. After the defense forced the Patriots to go three and out on their next drive, he did it again. But this time it was a 10-play, 77-yard drive. The first scoring drive ended with Marcedes Lewis catching a four-yard touchdown pass. The second one ended with Leonard Fournette taking it in from four yards out. But then the Jaguars did the one thing you can’t do if you want to beat the Patriots. They made a couple of stupid, costly mistakes on New England’s final drive of the half. The first was an unnecessary roughness penalty that resulted in Rob Gronkowski getting knocked out of the game (concussion). On the next play, Brady tried to go deep to Brandin Cooks but got the next best thing to a completed pass—a pass interference penalty on A.J. Bouye worth 32 yards. Two plays later, James White scored from a yard out to make the score 14-10 at the half. New England’s defense played much better in the second half, but Jacksonville’s continued to play well also. Early in the fourth quarter, a 43-yard kick by Josh Lambo gave the Jaguars a 20-10 lead. When Myles Jack forced a fumble on New England’s next possession, fans had to be a little concerned. 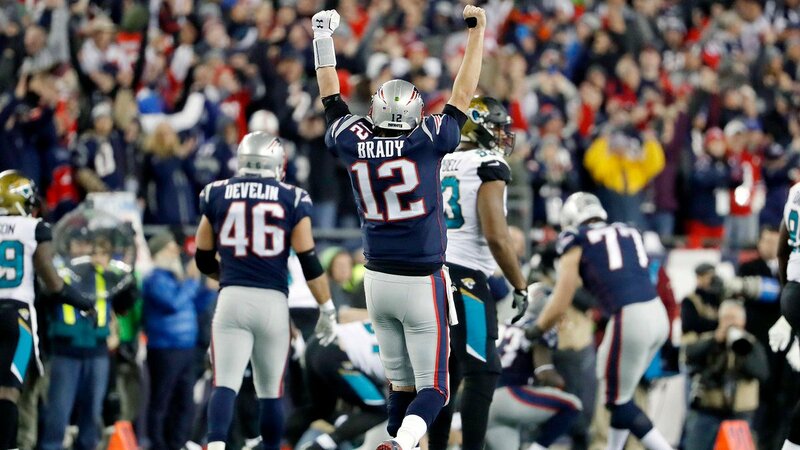 But then the defense held and forced the Jags to punt—and Tom Brady did his thing. Eight plays later he capped off an 85-yard drive with a nine-yard touchdown pass to Danny Amendola. 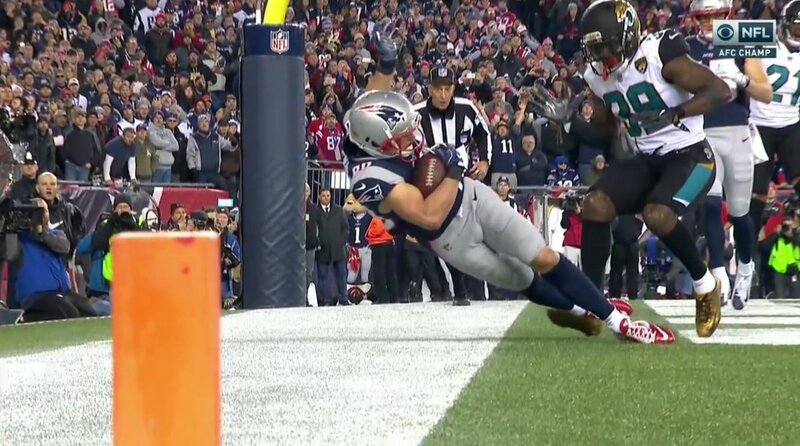 Later in the quarter, Amendola set up the go-ahead touchdown by returning a punt 20-yards to the Jacksonville 30-yard line. Five plays later it was Amendola on the receiving end of a four-yard touchdown pass from Brady to give New England the lead, 24-20. The Jaguars had a shot still with 2:48 left to play, but they couldn’t muster enough offense to get the ball downfield. Final score—Patriots 24 Jaguars 20. New England does not have a great history in playoff games when down by ten in the fourth quarter. Over the last ten years, they’d managed to win just two of six. But they do have much better luck than the rest of the NFL (who is 3-70). Their latest comeback improves that mark to 3-4 and gives Brady 54 fourth-quarter comebacks. The hand injury that got so much attention early in the week was clearly not an issue as Brady completed 26 of 38 passes for 290 yards and two touchdowns. Blake Bortles had a decent day as well (23-36 for 293 yards and one touchdown). But in the end, he couldn’t get the job done. The focus now will be on the health of tight end Rob Gronkowski. But with two weeks until the game, he should be able to clear the league’s concussion protocol.